Linda McDougald, principal and lead designer of Linda McDougald Design l Postcard from Paris Home, re-designed and renovated her home, which now showcases an innovative mix of contemporary and antique furnishings set against a dramatic linen, white, and gray palette. The English country home features floors of dark-stained oak, white painted hardwood, and Lagos Azul limestone. Antique lighting marks most every room, each of which is filled with exquisite antiques from France. At the heart of the re-design was an extensive kitchen renovation, now featuring a La Cornue Chateau range, Sub-Zero and Miele appliances, custom cabinetry, and Waterworks tile. This is an inspiring project! Would you please share the window trim color? Thank you. Gorgeous - can not find Benjamin Moore Bronzetone 60? Discontinued? Benjamin Moore Bronzetone 60 is still available. Your local Benjamin Moore retailer should know exactly what it is. The design is great! 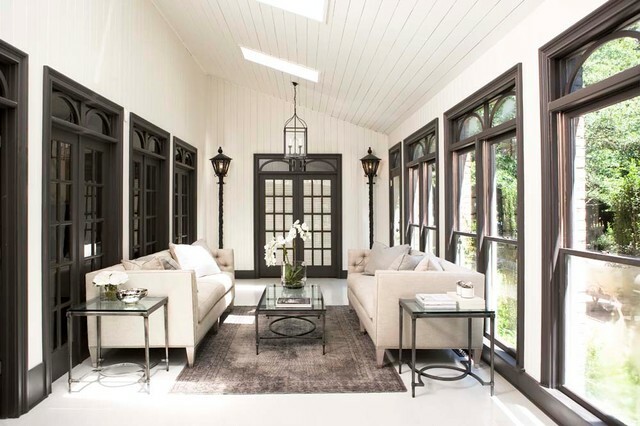 what color was used on the porch ceiling? These sofas are designed by Lillian August and available through Postcard from Paris. Please contact us directly for additional information. Love the lantern! - Who makes the lantern? I have been searching for one and this would be perfect! Thank you. These are antique lanterns that were purchased in France. It looks very similar to a Lantern & Scroll light fixture (find them on here or Facebook or www.lanternandscroll.com) I think maybe their John Street collection. Also, if they can make a custom fixture as well. They are awesome to work with and very reasonably priced. Cheers! I love the end tables & coffee table. Would you tell me the designer? The tables are by Bernhardt, which is among the lines we carry at Postcard from Paris. They are simple standard windows with transforms above. The wooden arches were custom crafted locally and placed in transoms to create the custom look. Floor - Love the room! What material is the floor? Thank You! It is painted hardwood. I love the street lamps. Where did they come from? Thank you! These antique street lamps were purchased directly from France. Hello, what color and brand of White paint did you use? Comfort of Sofas - I noticed you use Lillian August a lot. Her sofas are very fashionable. However, how do you find their comfort level? I am looking for a timeless sofa that is super comfortable.